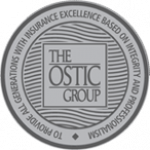 At the Ostic Group, we live by our mission “to provide all generations with insurance excellence based on integrity and professionalism”. Our vision as insurance brokers in the Guelph, Shelburne, Elora, and Fergus communities is “to achieve our individual and collective potential through applied innovation in the delivery of unique value added customer experiences in a positive, profitable and progressive work environment”. At the Ostic Group, we have 5 organizational values that we uphold everyday as insurance brokers. Integrity – Say what you mean and do what you say, with honesty, sincerity and empathy, acting with passion and professionalism. Respect – To hold everyone in high regard such that you treat them how you would like to be treated. Professionalism / Customer Service – Act in a competent manner with utmost good faith and maintain the expert knowledge to serve our clients’ best interests, all while building and maintaining strong working relationships with all whom we interact. Personal Responsibility / Team Player – Take ownership and embrace personal excellence. Contribute your professional excellence to the broader team to deliver internal and external customer service that we can all be proud of. 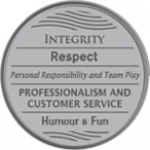 Humour / Fun – Is being able to laugh and share in an environment that promotes teamwork and allows us to celebrate our collective successes. At the Ostic Group, we live and breathe our organizational values everyday. So much, in fact, that we had a coin minted that features each of these values. We hope that our employees carry it with them each day to remind them what makes the Ostic Group so special to the Elora, Fergus, Guelph, and Shelburne Communities. Our Elora Insurance office can trace it’s roots back to 1907 when Sem Wissler was acting as an Agent for Waterloo Insurance. Sem operated a law practice and Insurance Business in Elora up to 1937 at which time he sold the Insurance business to R. Rumble. In 1942 James C. Fasken purchased the Insurance business from Mr. Rumble and operated an Insurance and Real Estate office. Of interest, Mr. Fasken moved the business to the current location on Metcalfe Street in Elora in the early 1950’s. Hugh M. Waind joined Mr. Fasken in 1953, eventually purchasing the Insurance business outright in 1957. Hugh’s son Tom began working for the business in 1980. Hugh established strong community links in Elora based on volunteer activities and strong customer service. Many of his clients are still clients today. Hugh M. Waind Insurance, and eventually Waind Insurance Brokers Ltd operated until 1995 at which time Hugh and Ivan Ostic merged their respective business’ to form Ostic Insurance Brokers. Tom lives in the Town of Elora with his family and continues to be an active community member. The earliest historical reference for the Fergus Insurance Office of Ostic Insurance Brokers is an operating contract from Economical Mutual Insurance company issued in 1880 to A.C. Hamilton. The origins of this family owned business stayed true through to 1934 when J. Milligan became involved. Family roots once again took hold when Ivan Ostic purchased Northmore Insurance, Youngblood Insurance, McNiven Insurance and eventually bought out Milligan Insurance the next year. Ivan’s sons entered the business in 1979 and 1981. Brokerage acquisitions through the 1980’s included the purchase of Hawkins Insurance, Guelph Insurance, and the Gilchrist Agency business. A merger with Waind Insurance brokers took place in 1995 – another long time family and community based business. Don Leaman and Joe Croft were partners in the early 1970’s. In 1976, the name of their partnership changed to Guelph Insurance. In 1979, a partnership with Sheridan Insurance Brokers was formed to help grow the operation. Rick Reidt joined the organization in 1979. Rick became an partner in 1980 and managed the business until 1992, when Ostic Insurance purchased it . Rick joined Ostic Insurance and continues to work with us today. In 1998, Milt Ball Insurance Broker was purchased and merged into this office. The recent acquisition of Steele & Steele Insurance Brokers in October of 2013 completes the story. The first insurance contract appointment for the James Pickering brokerage located in Shelburne was with Economical Insurance in 1937. This would eventually become the modern day Shelburne office for Ostic Insurance. Over the years and through acquisition, T. Harold McGhee eventually owned the original James Pickering office. Mr. McGhee sold to Robert Eby and the business was renamed the Shelburne Insurance Agency Ltd in 1977. Ivan Ostic purchased the business from Robert Eby in 1983 and the new Ostic Insurance Brokers Shelburne branch office was opened. Jamie Ostic and his wife Cheryl moved from Fergus to Shelburne so that Jamie could take on the management responsibilities for the new branch office. Jamie and Cheryl raised their children in the community of Shelburne and continue to live in the area today. The Ostic Group is proud to provide insurance excellence in Elora, Fergus, Guelph and Shelburne. Contact us to learn how we can meet your insurance needs.